Save and name it whatever-you-wish-to-name-it continued with sh extension, so it will be like “i-wish-to-name-it-like-this.sh”. After that, give this file ability to be run, with command “chmod +x i-wish-to-name-it-like-this.sh”. 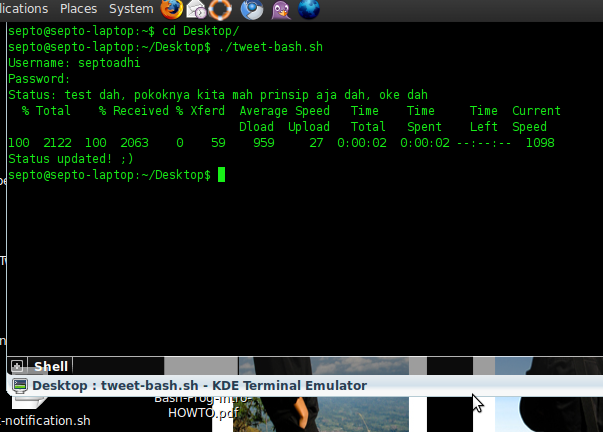 Then just try run “./i-wish-to-name-it-like-this.sh”. Kie kowe dolanan bash arep ge mendukung skripsimu po iseng-iseng berhadiah? nampaknya pas lulus jadi jagoan nih..
it doesnt work anymore ha? Tweeting From The Shell. Nuts.